1. It was in the month of Shvat in the winter of 1986. I was an 18 year old and together with the rest of world Jewry we heald our breaths when they announced your release from the Russian prison. I’ll never forget your picture on the Glinka Bridge, freed because of a US prisoner swap with Russia. I remember you as someone skinny with a child’s face with a ‘kutzma’ rabbit fur hat on your head. You looked sickly and lost, for the Russians actually ruined your health to the point of endangering your life. You zigzagged across the bridge. People thought you were going to topple over on the ground but we later found out you zigzagged became the Russian officer told you to walk straight and you on purpose did the opposite. I won’t forget the reception for you at Ben Gurion Airport with Prime Minister Shimon Peres and Foreign Minister Yitzchak Shamir. When you came to Israel you asked not to be called Anatoly any more rather by your Hebrew name Natan which you were careful to use during your long years in Russian prison. 3 months later you flew to the states with your wife where you were awarded a gold Congressional medallion, the second highest award in America. 20 years later you got the Presidential Medal of Freedom from President George Bush becoming the first Israeli and 4th non-American to receive both of the highest honors in America from congress and the president. 2. I want to backtrack a bit. I’d like to ask, why did you get these awards? Why did you sit in a Russian jail? Please allow me to give the readers some background and I’ll continue our letter after that. Anatoly Sharansky was born in Donetsk in the Ukraine (then part of Soviet Russia) to a Jewish family. In 1973, after asking for a visa to Israel and being refused because of ‘security reasons’, Sharansky became the main speaker for the ‘Prisoners of Zion’ and Jewish ‘refuseniks’ that were denied visas to Israel. In July 1978 Natan was sentenced to 13 years imprisonment. In his autobiography “Fear no Evil” he wrote that he succeeded in surviving the detention camps and the labor in the Gulag because he clung to his Jewish identity and his great desire to come to Israel, which in their merit gave his soul its freedom. Sharansky related that he once sat with a few jail wardens and told them they are all slaves and he is the only free one in the room. All the wardens must listen to their commander and have no free will whatsoever whereas he had freedom of the soul and freedom of thought. He is a Jew and not enslaved to anyone. During his years in jail he became the symbol of the human rights battle against Soviet Union oppression and the battle for Judaism there. Singer Mordechai ben David wrote 2 songs inspired by Sharansky pleading to free him and to encourage him. One was ‘Let My People Go’ and the other one was ‘Hold On’. On February 11th, 1986 after serving 9 years in prison Sharansky was freed in a spy swap where Russia got 5 spies back and gave the US 3 spies back with Sharansky among them. Natan Sharansky had many different positions in Israel including MK a minister and the head of the Jewish Agency. Now we can go back to our letter. 3. Who would believe that you who succeeded in getting out of Communist captivity? Who would believe that you, who even when in prison felt yourself a free man, of all people specifically you would fall into the captivity of the reform movement which is a few times worse than the Communists for reasons which I will soon explain. 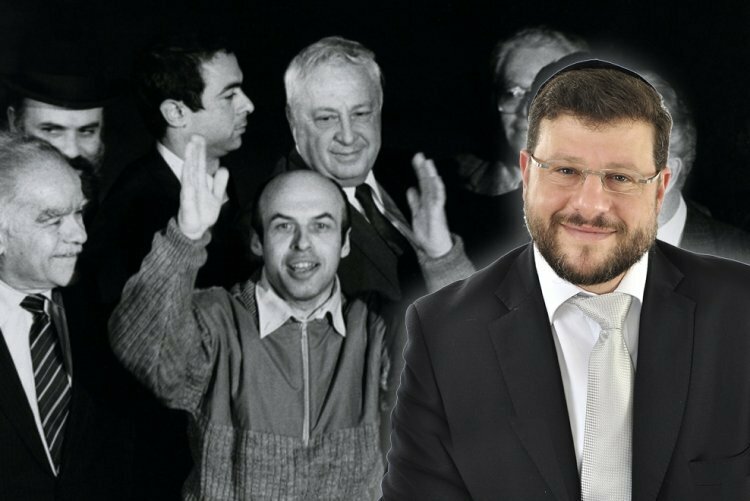 We knew for a long time that the Reform movement took over control of the Jewish Agency and we can understand why. When they saw they have no foothold in Israel and after 70 years of aggressive political activity they have only succeeded to establish 3 insignifigant ‘synagogues’, they found themselves out of the consensus. They are in the same place as the extreme left that controls the media, the court system, the attorney general office, and all hubs of power and still gets no more than 5-6 seats out of 120 in the Knesset. The left tries to do this with the ‘New Israel Fund’ that supports anyone that can somehow shake up the delicate tapestry of life here in Israel. They want to cause strife between Jew and Arab, right and left, religious and non-religious and between men and women. The reform does the same thing through a whole gamut of foundations and bodies whose sole purpose is to make a forgery of the Torah and offer an alternative Judaism, which is a euphemism for eradicating Judaism. In essence, creating a forgery of Judaism is far worse than trying to eradicate it and we will soon understand why. 4. In 1949 George Orwell wrote a book called 1984. The author portrayed a form of government that was either a parody of communism or perhaps even worse. What can be worse? The hero of the book works in the ‘department of documents’ in the ‘ministry of truth’ and his job is to rewrite ‘problematic’ newspaper articles and history, deleting people who used to be with the party and fell out of favor or did something against party lines. Tens of thousands of clerks in the ‘ministry of truth’ have to make these problematic events and people of the past evaporate from the face of history. They must wipe their names off of files like dates of birth and more, so their existence ‘never was’. Winston Smith, our hero asks the cruel interrogator, ‘what should I do when I see something in front of my eyes? 2 plus 2 is 4! The interrogator answers: “Sometimes Winston. Sometimes it’s 5, sometimes it’s 3. Sometimes it’s both at the same time. You must try harder.” The interrogator then asks Winston if something that happened, was rewritten, fixed and was falsified still exists in his opinion. Winston answers: But it does exist! It exists in memory! His interrogator responds: “I don‘t remember it” and in other words we want to control the memory of the people. These dialogues express a basic Jewish concept which the Greeks tried; it's called “to make them forget Your Torah”! 5. Natan Sharansky, did you know that the Communists that imprisoned you for 9 years forbade you to observe the mitzvoth of Judaism. But they never for a moment tried to change Judaism, they just forbade it. They succeeded in preventing millions of Jews from keeping any Torah or mitzvoth and prevented their children from it too. But they never succeeded nor did they even try to tamper with the Torah itself! The Torah sat in the corner quietly until Communism evaporated and when that happened hundreds of thousands of Jews came back to the Torah that was patiently waiting for them. The Nazis did something else, more severe. They killed the Jews who kept the Torah and also the ones who didn’t. They burned thousands of Torah scrolls and millions of Jewish books. But even they didn’t change the Torah before they burned it! They burned the Torah, those who kept it and those who didn’t, but they too never tampered with the Torah. For the Torah isn’t just parchment or paper, it’s the content which we received at Mount Sinai. It is perptuated by its scholars and those who learn it until this very day. But the reform movement; they want to do something awful! They want to make a forgery of the Torah. They want to do something that none of our bitter enemies in history even thought to do! They want to make sure Shabbat is no longer. No tefillin, no conversion, no kashrut, no siddur (prayer book) and no prayer! Certainly no longing and saying “may our eyes merit to see Your return to Zion with mercy” which was the verse that became the Jewish Agency’s motto. Are you aware of the fact that they erased that verse from their ‘prayer books’? The reformers are creating circumstances that assure there will be nothing to come back to. There will be nothing to long for. There won’t be anything worthwhile to be imprisoned for or get released for. There won’t even be anything worth dying for. This is the direction the reformers are taking; destruction, chaos and annihilation. And they want to take us with them. Hold on tight Anatoly. You overcame the communists? You must also overcome the reformers even though they are far more powerful and sophisticated. The communists wrought their harm by inflicting pain and torture. The reformers do it with sweet talking, bestowing great honor and fat paychecks. You, who survived the captivity of Communism fell into a far deeper, more dangerous and more sophisticated captivity. Please open your eyes and see this. The millions of Jews who prayed for your release and freedom didn’t pray for you to fall out of the frying pan into the fire.